This little gem is located in Golden Beach, a quiet residential area about a mile from downtown and a short walk to the Gulf of Mexico. 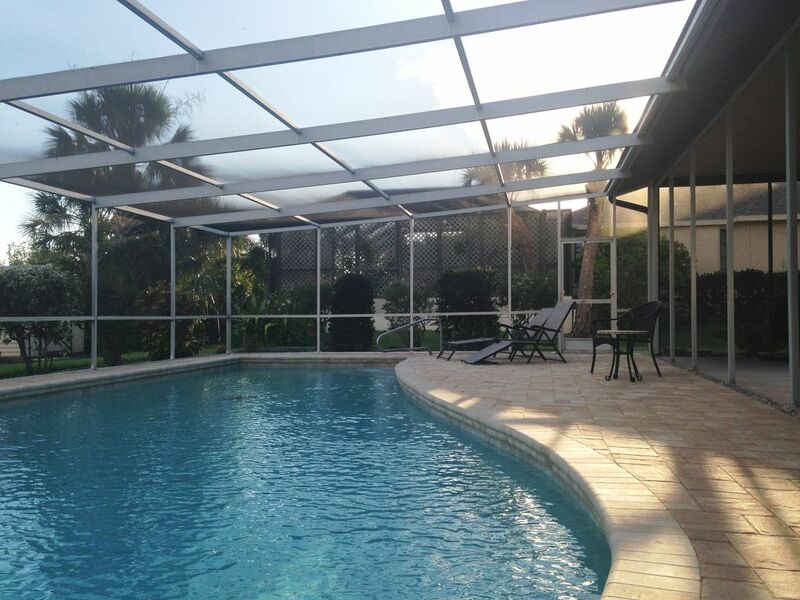 We have a screened-in lanai enclosing a 40 foot heated pool. Just enough for swimming laps (if you're a swimmer). Lush greenery surrounds this lovely poolside setting. This home is a serene retreat, small and simple, but with an open, airy, and inviting atmosphere. Swimming Pool: 40 foot long. You can swim laps here. Heated by electric heat pump, not by solar. (Solar is not as reliable). Spacious pool deck and screened lanai. Master Bedroom: Luxury pillow-top king sized bed Double sliding glass pocket doors open onto pool and enclosed lanai Private attached master bath with tub and shower, vanity Large walk in closet Ceiling fan Guest Bedroom: Luxury pillow-top queen bed Additional twin bed Large closet Sunny corner room Hall Bath: Large walk in shower Large vanity Living Room: Large flat screen T.V. with cable and remote Italian tiled flooring with overstuffed furniture Ceiling fans Living Room sofa has queen sized pull-out bed Dining Room: Elegant oval glass table with Dolphin carved base Double sliding glass pocket doors open onto pool and enclosed lanai. Kitchen: Fully equipped: dishwasher, stove, garbage disposal, and microwave. New dishes and kitchenware. Pass through window to pool and lanai. Direct access to attached garage and laundry area. The spacious 2 bedroom and two bath home was what we were looking for in a vacation rental property. The House was immaculate with plush bathroom towels and a very comfortable king sized bed. The pool was crystal clear and large enough to swim laps. The screened-in pool and lanai area were perfect for mild, bug free summer evenings. In fact, we ate all of our meals out there. The quiet, peaceful beach is an easy three minute drive or ten minute walk (we stroll) from the house. The main business streets of Venice were a five minute drive from the house, featuring good restaurants and all your shopping needs. We especially enjoyed the following restaurants, providing excellent service and good meals: Cafe Venice, Made in Italy, The Crows Nest, and Cassariano. The owner's representative was only a few blocks away and was available should any need arise. We definitrely recommend this home. We enjoyed our two weeks there and will definitely return. We will definitely be back to stay!!!! My wife and I stayed here for Xmas it was beautiful weather the house was very clean and is like home away from home. The notes and info about the home functions were simple to follow and John was very helpful and accommodating on any questions we had. The beach was a 5 minute walk and a 2 minute bike ride. The pool is big heated and relaxing and private we didn’t see a sole while we were there the property has lush tropical greenery that provide the ultimate privacy. From the home We could even hear the gulf of Mexico waves rolling onto the beach very pleasant surprise. This house was a great gem to find I hope others will enjoy staying there as well. My parents live in Venice and it gets busy at their home when family is in so me and my wife will stay at flamingo and we will definitely be back again!!!!!!! We've been to others but are coming back to this comfortable home again soon. Each bedrm has an adjacent bath, one with a lg tile shower & the other with a tub/shower combination. Closets & drawers are empty and available for our belongings. Both the dining area and the master have lg slide into the wall glass doors that open directly onto the screen enclosed patio & heated pool. This outdoor seating area is weather protected by the home. Much of our time with friends is spent here. We've rented homes without a washer/dryer and love that this time we could do our laundry at home. We enjoy varied cuisines at the many area restaurants, walk the beaches, take day trips and classes at the Venice Art Center. The quality of the beaches and parks from Sarasota through Siesta & Casey Keys, Venice, to Manesota Key are outstanding. It's really nice to walk rather than drive to the Venice Beach. We were amazed at how sparkling clean this home was for our arrival. with basketball, tennis, shuffleboard courts, and children&rsquo;s playground. of-state artists as well as art classes for children and adults. Coffee Shop, old fashioned traditional Soda Fountain Shop, TJ Carney's, etc. full-length piers on Florida&rsquo;s west coast, and adjacent Sharkey's Restaurant. fishing... Jet skis, and all variety of boats are readily available for rent. The Bay Lady is a local boat that offers guided tours of Venice&rsquo;s waterways. Excellent golf courses are everywhere. Magazine as one of five most appealing USA cities. Contact Owner for actual rates based on listed amounts. No pets / no smoking. $500 minimum refundable deposit. Taxes collected for State and County. Contact Owner for stays less than 30 nights. Available only as local ordinance allows.